My initial portable antenna built for SOTA was a copy of the Link Dipole described by Peter VK3ZPF on his blog. For those first few activations, I carried the link dipole with 80/40/20/15/10 capabilities, plus a 10 m squid pole to support the antenna. As the activations were done in daylight, I realised at the end of a long walk that I could reduce the mass carried in 2 ways: change to a 7 m squid pole (saving 500 g) and build a new link dipole without 80 m, thereby halving the length of wire carried. So a built a new link dipole with just 40 & 20 m in mind. This worked well, but I was still considering how to make it all lighter. I searched on the web and found some very light wire offered in Germany (DX-Wire UL). I searched for an alternate source without luck, so ordered some wire, which arrived about 2 weeks later. Then I started building the new link dipole, initially with all HF bands 40 m to 10 m. I can change this in the future if I wish. I decided to make a centre insulator and the insulators for each link position out of some 1.6 mm fibreglass pcb material. So some marking out was followed by drilling lots of holes, then cutting and filing everything to shape. My machine shop skills are nothing to write home about. There is significant variation in the final size and shape of the link insulators, but they work fine. The wire is 1.6 mm OD and I choose to drill the strain-relief wires at 2 mm. The connector used is a BNC socket, which required a hole a bit over 8 mm (I drilled 8 mm and enlarged with a file) plus 2 holes at 2.5 mm to fix the connector to the centre insulator. I have not yet attempted to waterproof the centre connections or to clean off the solder flux. After calculating the likely wire lengths needed, I started at the dipole centre. Run each of the lengths of wire (cut long) for 10 m through the outer strain relief hole and then back through the inner strain relief hole. Strip back the outer insulation carefully so as to not nick any of the six strands of 0.25 mm TCW. Next tease the 6 wire strands out from the aramid (Kelvar) fibres and trim the aramid fibres. Twist the wire strands together and solder to the centre of the connector pin for one side and to a solder lug to be fixed to the connector outer by the connector mounting hardware. Once happy, clean up and work the extract wire out to the final position required, with a little slack so that there is no strain on the soldered connections. Feed the wire through the strain relief holes of a link insulator, with excess wire at the outer end. Hook up the dipole centre to your favourite antenna support, connect the coax and erect the dipole, using rope/twine to hold the dipole ends out at the approximate angle to be used in the field. Measure the resonant frequency of the dipole. If you cut the wire a little long, the resonant frequency should be low. Calculate the required correction to the dipole length and trim to length. Many prefer to do this over several steps to ensure that they do not end up with an antenna that is high in frequency and you have to either start again or add some wire back on. 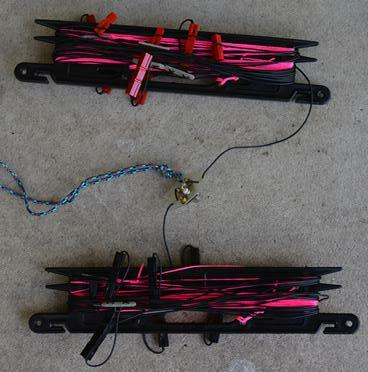 Once happy with the resonant frequency, lower the antenna and terminate the outer end of the wire with the connector of your choice – I used Anderson PowerPoles (the 15 amp connectors). This is a little more complicated than it sounds, due to the wire construction of the lightweight wire used by me. Carefully trim back about 12 mm of outer insulation. Crimp the connector & wire, with the aramid fibres passing through the connector. My logic here was that the aramid fibres should take any mechanical strain, hopefully without preventing good electrical contact being made between the twisted wire and the connector – it seems to have worked. As an extra, I added a short length of heat-shrink tubing over the end of the the connector and down over the end of the wire. Finally insert the crimped connector into the PowerPole shell, ensuring that it is properly seated. In the image above, the sequence is from right to left, with the extreme left showing the completed wire ready to insert into the connector shell. It is then a matter of going through all the steps again for each band. I first prepared and terminated one end of the wire, then threaded the wire through the 2 strain relief holes. Then thread the far end of the wire through the strain relief holes of the next link insulators. 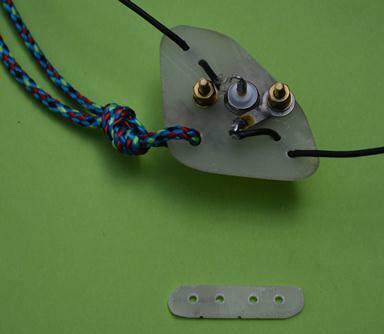 Next, check the resonant frequency of the new length, with the link for the first band closed – the connectors joined. Adjust for length, lower the antenna, terminate the wire end, and so on for each band to be added. I terminated the outer end of the last band (40 m at present) like all the others with a PowerPole connector. If I decide that I wish to add 80 m capability to the antenna, all I need to do is to detach the line that holds the ends of the dipole out, and add new pieces of wire to give me the extra lengths needed for 80 m.
I had some “wire winders” on hand that I had purchased from TET-Emtron. A pair of them come in at around 118 g. With the link dipole added plus 10 m of builder’s line one each side to hold out the antenna ends, the entire assembly is only 280 g.
It is much lighter than the old 40/20 m link dipole! It seems to work fine, having been tried in the backyard and on several summits without any issues so far. Shortly after I started on the assembly process, I found an alternate source of the wire in China. After asking for expressions of interest via the SOTA Australia group on Yahoo Groups, I took the plunge and order a bulk quantity of the wire. I anticipate that there will be many new “ultralight” antennas built in the near future by SOTA operators. I have also obtained a new squid pole that is only 66 cm long and only 380 g. It saves on mass and fits inside the pack, making it easier to negotiate thick scrub. The downside is that the top sections are extremely flexible, so the dipole centre is only at around 5.5 m above ground. This entry was posted in Equipment, SOTA. Bookmark the permalink. Hi Peter, thanks for the detailed description of building your new antenna with the aramid wire. I will be starting mine soon. I will do a trial run on making the connections first before making the final version. The only potential weakness I can see, based on your description, and you identify the possibility, is ensuring that the connection within the power pole is effective (six wires among the aramid fibres is not much for a metal to metal contact): but I guess if you get it right, it should stay working! Yes, you are correct. I deliberately bought the wires out from amongst the aramid fibres and then doubled the wires over, increasing the area & volume contained within the connector with the wire prior to crimping. I am aware that it may fail down the track. There is always the possibility of soldering the wire to the actual metal portion of the connector: an option that I have if the need arises.